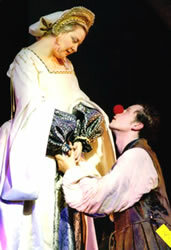 Paul Barnhill as Jack Point, and Janet Fairlee as Elsie Maynard – 2002 Savoy Theatre Production. 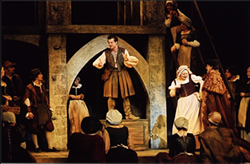 The Yeomen of the Guard opened at the Savoy Theatre on 3rd October 1888. It was triumph for Sullivan who had long complained of the plots that Gilbert was providing him with. He wanted less absurdity in the plots and something more weighty. Gilbert eventually came up with the plot for The Yeomen of the Guard and Sullivan approved. Initially it was called ‘The Tower of London’, then ‘The Tower Warders’ and ‘The Beefeaters’ before finally arriving at ‘The Yeomen of the Guard’. Sullivan was delighted as the characters were believable and the plot was logical. Despite all this, as opening night approached Gilbert became increasingly apprehensive. Would the audience accept this new seriousness from them, would they understand it? Though the opening night reception was possibly more enthusiastic than for ‘The Mikado’, Gilbert was right to worry. 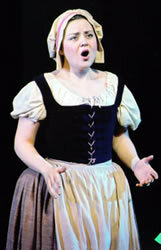 It was Sullivan who scored most notably with the critics. Gilbert was taken to task by almost every critic for plagiarizing. The Yeomen continued at the Savoy until 30th November 1889.